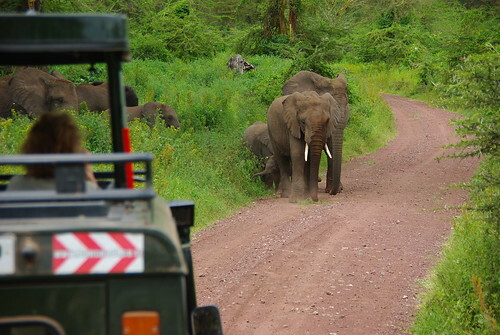 Sitting in Moshi and staring at prices for multi-day Safari tours, our heads began to spin. We’d researched several options on line and walking around town most of what we found seemed much too high in price for our taste. We wanted to go with a local company, but we also wanted to know that we were going to be safe, and not ripped off. Sitting with one safari guide, watching as his “arithmetic” defied the laws of probability, continuing to raise the price higher and higher, I politely excused myself and walked across the street to buy a soda. As I did, a man named Peter asked me if I would come into his office when I was done where I was. As my body and mind were still quite weak, having only returned from our Mt. Kilimanjaro hike the day prior, I reluctantly agreed. I did not regret that decision. We found Peter to be a pleasure to work with from the start. He provided us quickly with a variety of options so that we could design our own safari. He willingly confirmed several safari concerns that I’d had, that the Serengeti was too far from the Crater and to pay to do them both would have been a waste as we’d spend most of our 3 days in the car. His price was better than a 25% off discount from most of the quotes we received and he beat the next best price by 10% as well. Then he started to throw in extras and those extras just kept coming. His advice was spot on and everything he told us turned out to be factual and 100% true. That may not sound like much to you, but trust me, in this part of the world, that means a lot. The Land Cruiser was about par for the course, as was our camping accommodation. The nicest thing about the Land Cruiser was that the roof popped up allowing us to stand inside the vehicle with our heads and bodies sticking out the top. 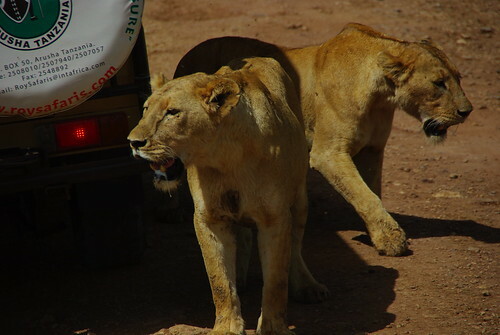 This was particularly nice when the lions decided to rest in the shade of our vehicle and we could sit on the roof with our beers in hand and just look at their beautiful faces. When the rains came the top came down and our tents did not leak either. Our safari itself went according to plan. We had no problems, no surprises, and most importantly, excellent food. Our three day safari not only included two nights camping accommodation near the parks but Peter also put us up in a nice hotel with air conditioning (a big step up from where we’d put ourselves before the safari began) and kept the food coming, paying for dinner on the 3rd day and breakfast the next day as well. When I left something behind in the safari vehicle, he even arranged for it to be brought back to Moshi for me at no additional charge. Like I said, Peter was a pleasure to do business with and we wish him great success. Although we only found Peter in Moshi after we’d completed our Mt. Kilimanjaro hike, we did learn that he also arranged treks up the mountain as well for, what we felt to be, an extremely low price. If you are looking to climb Kilimanjaro and then take a rewarding safari after the climb, I think Peter can probably arrange an amazing combination tour for you. He started on Kilimanjaro as a porter, later a guide, and recently started his own touring company. P.O. Box 419. Moshi, Tanzania. East Africa. We received no compensation of any kind for this review.